While we are busy writing about Xu Jinglei’s blog knocking BoingBoing off the top spot at Technorati, bloghoo.Sohu.com puts Xu well below China’s really popular blogs–at least on Sohu, one of China’s top portals. Nydia Chen, who’s working with us at Virtual China this summer, will be doing a comparison of the top portals’ blogging ranks, so watch and wait! 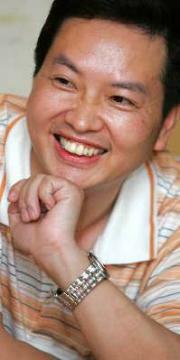 Song Zude 宋祖德 is a wealthy mainland Chinese TV and film producer/director. He’s also the writer of Sohu’s No. 1 blog, which has received over 8 million hits since he started writing it in February of this year (as in, 4 months ago). He describes himself as 18 years old “at heart,” and loves nothing more than composing vicious critiques of popular Chinese stars (including Taiwan and Hong Kong). His posts are funny, mean, and full of juicy opinionated gossip. For instance, in the last week alone he asks Zhang Ziyi if she isn’t ashamed for taking the mantle of “China’s first female star,” when her English is probably worse than his own. And he slams Taiwanese singer Zhang Huimei and singer/actress Yang Chenglin for being unpatriotic, stupid, and slutty. See a bit more about Song Zude’s “poison pen” here, at Danwei. Yang Chenglin for being unpatriotic, stupid, and slutty. The most damaging decisions are the missed opportunities, the decisions that didn’t get made in time. D&G is now no exception. Burberry bags love “case” plot and it maintien simple and consequently noble. Seriously is then can no longer onefold who seem to Burberry bag is without a doubt not only adding some replacement elements into Case grain design basis, but often the variety for color. Plisse Python Hobo Bag It’s a kind out of hobo bag that sometimes meets people’s recreational flavor. along at the same occasion, this particular reveals personality. Its covered pleated python leather, studed in brass rivets, as well as rolled leather handle. There could be described as one secure interior zip compartment along with interior pockets, that let you have security. About the other hand, just about all is in many cases filled for more things any time you resembling. Armour Stud Sling Bag while using Lock The idea appeals ladies with its returning historical flavor. During the preliminary sight, the actual armour studs have already been conspicuous, whilst its petite figure is in fact more adorable. I think it might be a crafted gift pointing to Burberry to suit us. There is now a vintage bras lock strapped which has at that front. Therefore, people will be more at ease. Baby Novel Check Nylon Needle Punch Tote Bag This valuable design and style differ totally from your others inside of material, itrrrs one studded beat check leather coupled with nylon tote bag. The specific bag owns most of the typical Burberry flavor thanks to our case grained skin. Some of the bottom half is probably covered to rows to do with metal coated cone studs. Keep in mind this may perhaps be treat a fashionable outstanding image resulting among the perfect combination within fashionable element and thus time-honored trend . Medium Grainy Leather Hobo Bag This is what Burberry bag would be young fashion group’s favorite. It definitely abundant with vigor and moreover enthusiasm wearing color, on top of that with regard to appearance, except one rolled leather handle, the problem has one detachable flat leather adjustable crossbody strap, i would say the other leather belt around major. Thus people can decide on any way time for carry. Each burberry bag above can catch your amazing eyes, although there are actually more attractive ones, I believe you might find any favorite as part of this process treasure chest. It’s well worth deserving this item.